Flipstah is a must for every fisherman." What do you get when you combine the fun of playing a video game with a simulation of on-the-water casting? The New Booyah Flipstah. Hone your flippinâ€¢ and pitchinâ€¢ skills while having fun with the whole family. Great for beginners or seasoned anglers. Includes a foldable lake mat, multiple realistic targets, two magnetic jigs, LED scoreboard and a wireless remote control. You can play up to three different games with up to four players each, right in the comfort of your living room! If you are a bass fisherman, chances are that sometime during the past month you’ve been rigging up a few rods in the house and suddenly go the urge to see if you could flip that 3/8 ounce jig under the chair and next to a leg of the kitchen table. A successful pitch resulted in the thought flashing across your mind of, “man, I can flip or pitch this jig just about anywhere,” while an unsuccessful attempt resulted in a nicked up chair leg and a 5/0 flipping hook buried in the carpet which you ended up cutting out with scissors before anyone else in the house noticed the mishap. 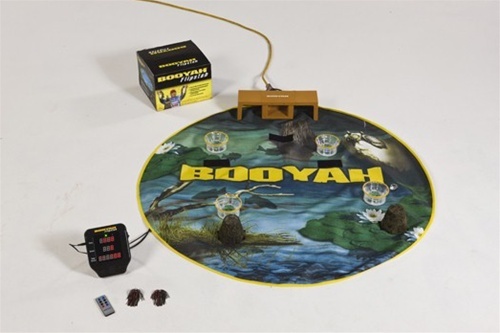 Booyah has created an interactive flipping and pitching game that will test the flipping and pitching skills of all anglers and also eliminate the chances of scratched furniture or a hooked house pet. The Booyah Flipstah is a game that involves flipping and pitching a hookless jig to 4” targets arranged on a 46” mat. “The targets are cups that have sensors in the bottom and the jig that you flip into the cups has a magnet so when it goes into a cup, the magnet triggers the sensor and then your score pops up on the scoreboard. “When it is winter and you can’t be out on the water, you can be in the garage or in the living room playing this game and it’s interactive so it’s not just a computer game where you are sitting in front of a screen motionless. The Flipstah is applicable to anglers of all skill levels and ages from the avid fisherman looking to improve their accuracy to the novice looking to learn how to flip and pitch. The Flipstah retailed for $99.99 and was exclusively available at Bass Pro Shops.